There was once a time when nobody knew what a Wookiee was. Before the first Star Wars movie exploded onto the public’s consciousness in May 1977 it was a completely different time for fans of movies and sci-fi. Steven Spielberg’s Jaws had only been released the year before and had unexpectedly become the first modern age box office hit. Hollywood hadn’t yet realized that it was about to enter the era of the summer blockbuster and didn’t yet know audiences were craving imaginative cinematic experiences to distant galaxies and high adventure. Back then, Star Wars was an unproven concept. Science fiction films didn’t make big money and were considered risky gambles for studios to take. And for a 32-year-old filmmaker named George Lucas who had a vision of Jedi Knights, dark Sith Lords, droids and princesses in peril, selling a major movie studio on making Star Wars was only part of his challenge. Lucas had to convince dozens of other people to risk career suicide and open ridicule to help him make his movie. And it wasn’t an easy decision for these people to make. Chewie is the screenplay written by Van Robichaux and Evan Susser that tells the story of the making of Star Wars – or as Lucas was calling it when he was filming his movie, The Star Wars. As the title suggests, Chewbacca is the central character of the script, or rather the 7-foot-3-inch British actor who portrayed him in four Star Wars movies. Just as Luke Skywalker was the unlikely hero dreaming of a bigger destiny, Peter is the unlikely protagonist who finds himself having to take a great personal gamble on what seems to be a foolish choice. Thirty years plus from the release of Star Wars, Mayhew’s decision to play the co-pilot of the Millennium Falcon seems like a no-brainer, but back then, it certainly wasn’t. Robichaux and Susser’s spec script landed high on the 2011 Black List, the annual compilation of what 300 Hollywood insiders vote on being the best unproduced screenplays of the year. Chewie placed third overall, with 59 of the 300 voters selecting it as their favorite spec of the year. Chewie deserves to be high up on The Black List. It’s a wonderful piece of writing that tells a very human story at its core. Sure, it’s cool because it will tell you things that you would never have dreamed actually happened to make Star Wars but the center of it is Peter Mayhew and his life-changing experience. And it’s a tale that’s told very well, from start to finish. So, let’s imagine that you’re sitting in a darkened movie theater and Chewie the movie is about to start playing. The first scene that you see is from Star Wars, specifically when Han Solo and Luke Skywalker, dressed as stormtroopers onboard the Death Star, are taking Chewbacca as their “prisoner” to the detention cell block where Princess Leia is being held. The scene starts to play out the way that you remember it in Star Wars but something goes wrong and a panel on the wall sparks. The actor playing the Death Star guard then breaks character but not before Mayhew, as Chewie, smacks him across the room. Then we pull back and see that Lucas and his crew are filming the scene we all remember from the movie. Mayhew removes his Wookiee mask, helps pick up the Death Star actor and excuses himself for the miscue. And then a moment later, Peter Mayhew turns to us, the viewer, and addresses the audience about what this film is about. He delivers his explanation almost apologetically, knowing that we’re all here to watch a movie about the making of Star Wars and not about him. Still, the story of the making of Star Wars is also about the biggest risk he ever took in his life, so he promises to not bore us too much about his particulars before sipping a cup of tea from the craft services table. Just two pages into Chewie, I could already tell that this was going to be really fun to read. Our story backtracks to 1974 and Lucas and his producer Gary Kurtz pitching the idea for The Star Wars to executives working for 20th Century Fox. It’s not quite the Star Wars we know and love today as some of the names of places and characters are still in flux, like Anakin Starkiller being a member of the Jedi Bendu. It doesn’t matter though because the Fox execs aren’t getting it at all – at least until they see the conceptual paintings that Lucas commissioned from artist Ralph McQuarrie. After seeing the space battles between X-Wings and TIE Fighters, a lightsaber duel with Darth Vader and Starkiller and the early form of Chewbacca, the Fox execs are sold. The Star Wars is a go project. For George Lucas, his troubles are just beginning. Chewie is spread across the three years it took to make Star Wars - Episode IV: A New Hope and shortly after its release and instant success. We get to see Lucas try out different actors for the parts of Luke, Han and Leia, and why those roles eventually went to the people that they did. Peter Mayhew enters the story on page 7 as a giant nurse orderly working in Kings College Hospital. Peter’s used to a daily job where the patients whose bedpans he changes look at him as a towering giant. It’s the first thing that they say to him instead of hello, and it’s something that the shy Peter has gotten used to. Throughout the first act of the Chewie script we see how Peter learns about a new sci-fi movie project that needs people of tall and short stature to play the parts of the aliens. We see Peter have to weigh his choice to ask his difficult boss for time away from his duties, to work long hours and behind a mask on a picture that no one working on really understands except for its director. We see Peter form his best castmate friendship with the then-19-year-old Carrie Fisher, young, naïve but not completely oblivious to the way people play games in Hollywood. Peter and Carrie get along so well that they begin to take their lunches together off at a local restaurant close to the production studio, sometimes still in their Star Wars costumes. Carrie gets a glimpse the humble, soft-spoken guy that’s behind the towering man everyone else only sees, and Peter gets a little smitten with this beautiful daughter of Hollywood royalty – but he knows that he doesn’t stand a real chance of ever connecting with her romantically. Instead, Carrie Fisher finds herself drawn to the charismatic 33-year-old Harrison Ford, who wound up being cast in the part of Han Solo because he was at the right place at the right time (and hanging around where a pissed-off Richard Dreyfuss was auditioning for Lucas, in a great comedic moment.) Ford is presented here as instantly likeable, an underdog who’s working hard to earn a living as an actor while also drawing a steady paycheck for his family as a trades carpenter. And as the filming of The Star Wars goes on, a married man who starts an affair with the young Carrie Fisher. Part of the magical quality of the Chewie script is that is shows us the actors and creative team of Star Wars as human beings, with all of their failings, worries, bravery and likeability. The characters of Lucas, Harrison, Carrie, Peter, Kurtz, the special effects team working at ILM, the distinguished British old school charm of Alec Guinness, the cockney blue collar personality of Kenny Baker (R2-D2) and the stiff, aristocratic foppishness of Anthony Daniels (C-3PO), are all sparkling in the dialogue that the writers bring to the script. Even brief moments like the all-business minded head of 20th Century Fox walking into the dark, marijuana smoke-filled warehouse where John Dykstra and the ILM team are creating the Death Star battle are delivered with the right feel of comedic timing and dramatic weight. If Chewie is directed the way that this script reads, it should remind you of the magic chemistry that The Princess Bride has so well. You’re carried along with the characters, laughing at the absurdity of the situation they’re facing one moment and then feeling their anguishes and triumphs the very next. With the right approach and development and yes, casting, this could be on-screen gold. By the time Lucas and his crew have walked through hell to get Star Wars shot, there’s still the waiting to go. Peter returns to his job as a hospital orderly, dealing with his insufferable boss. No one in his circle of family or friends knows what to make of his adventure acting as a giant walking carpet in outer space. Peter’s not even sure if the movie will be playing in a cinema as Lucas has run into serious budget issues. Fox is worried about what’s happening with the money being spent on special effects, and they’ve begun to doubt that this movie will be accessible to anyone except Lucas. On top of this, the problems between his cast, his crew and the studio have cast a dark cloud over the production. Things are running dangerously close to falling apart. 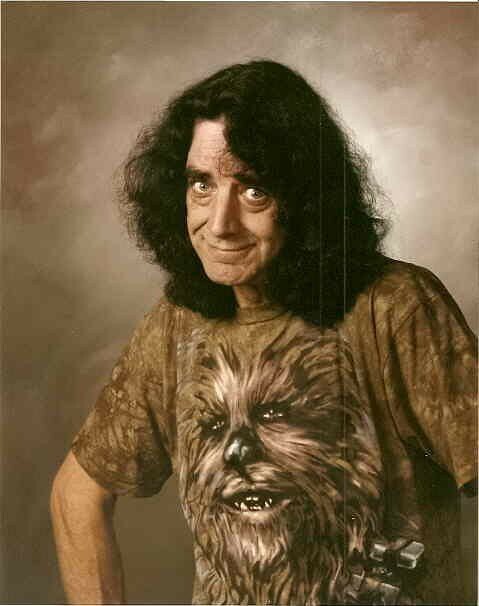 It’s at that darkest hour for George Lucas when Peter Mayhew comes to visit the studio. He’s quit his job as an orderly because of his boss, and instead of living his life as a timid field mouse, he’s realized that one of the greatest experiences in his life was when he took a chance and acted like a giant. It’s those words that give Lucas a sudden moment of clarity and he’s able to make a decision that allows him to finish his movie on an upnote. Sure, but does it end with something big blowing up, like a space station? If you think that I’m somewhat spoiling what happens in Chewie by telling you George Lucas finishes making Star Wars, well, I don’t know what you’re doing this far into my review. I’m purposely trying to avoid much of the detail in Chewie because there’s great stuff for you to discover on your own. The character arcs are complete not just for Mayhew and Lucas but for Harrison Ford and Carrie Fisher, and there’s plenty of moments of greatness. One such instance comes when the first cut of Star Wars is shown to the Fox president of production and several filmmakers in a private screening. One of the people seeing Star Wars for the first time is a young filmmaker named Steven Spielberg, and what he tells Fox’s Alan Ladd privately about his honest reaction to the film makes for one of the best moments to be found in Chewie. Just like another Black List script from 2010 took a creative risk in telling the fictionalized story of how Jim Henson created Kermit the Frog and the Muppets, the Chewie screenplay blends together the truth of what really happened with the magic storytelling that the movies can give to us. I’m just one of many people that have read the Chewie screenplay and loved it, and I’m certain that it’s opening doors for Evan Susser and Van Robichaux. What I truly hope will happen is that someone with A-level creative lout will also take interest in it, realize its creative and commercial potential (and there is a commercial potential here, believe me, it is Star Wars we’re talking about) and develop it so that the movie gets made. That would be a terrific thing for every Star Wars fan, and for those of us that want to see a great movie. And yeah, there’s room for a sequel. 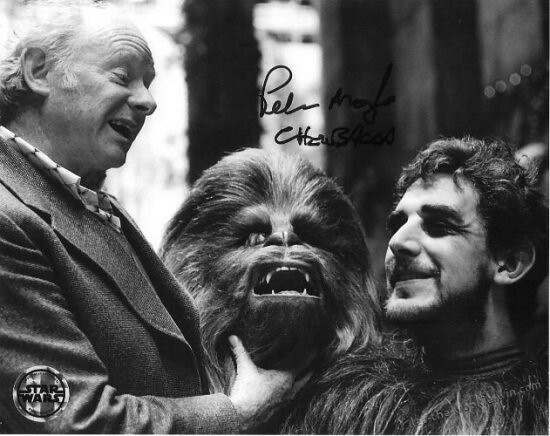 Imagine what stories Peter Mayhew's character could tell us about that one. I would both die and kill to see this film get made. It sounds similar in style to the recent Monty Phython semifictional biopic Holy Flying Circus, and that was fantastic. Seeing as how nobody likes George Lucas anymore, greenlighting this would be a great way to win back some credibility. Just as long as he doesn't change the screenplay. Or direct it. Or have any involvement in any way whatsoever. I see that the screenwriters have been hired to re-write the script to The Jetsons. Hopefully that will help and not hinder this being made.